First, Necklush was created by two artistic Brooklynites: Stephano Diaz and Troy Mattison Hicks. The two make each Necklush by hand; they print the fabric themselves, and then cut the infinity scarf out of one single piece of fabric. The response to Necklush has been amazing, and with good reason. Each Necklush is like a work of art you get to wear around your neck. And I can honestly say this is true: ever since mine has come in I’ve had a hard time taking it off my neck, even in 95+ degree weather. Yeah, it’s a little sad, but there it is. 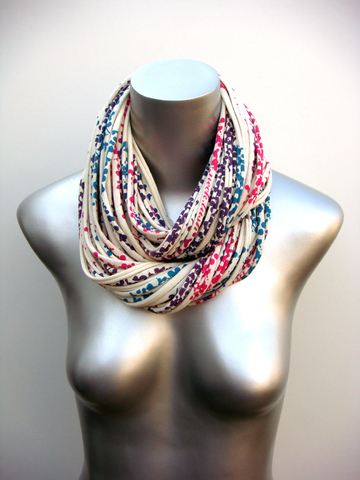 These scarves are seriously amazing. 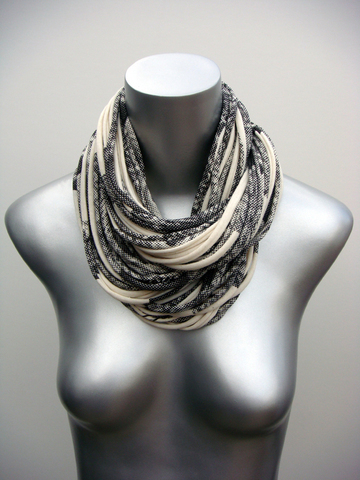 Need more proof that Necklush is more art than scarf? They’re sold in the Santa Monica Museum of Art, The Hirshhorn Museum and Sculpture Garden, The Institute of Contemporary Art Boston and the Weisman Art Museum Minneapolis. Necklush was also chosen to represent Etsy, yes, that’s ETSY, in the Smithsonian Cooper-Hewitt Design Museum’s Design Triennial “Why Design Now?”. Yeah. Huge. They’ve also been featured in plenty of high profile fashion magazines and sites such as Time Out New York, Kingdom of Style, Women’s Health, Glamour, LA Times Magazine, Lucky Magazine, Seventeen…I could keep going but you get the picture. In addition to the general awesomeness of these scarves, here are more reasons why you should support Necklush. Because each scarf is handmade right in Brooklyn, they have a low carbon footprint. They also are a proud sponsor of the relief work done in Haiti, by the organization World Vision. The duo also make a lot of effort to support emerging artists. Their other site, ThisArtIsYours, helps showcase these artists. So, Necklush is handmade. It’s fairly local. It’s socially responsible. And it’s cool.